We don't have Walmart in Oz, so I don't know anything about how they treat employees. Some time ago, I heard, or read that ' some American companies' had removed the automated check-out machines, due to the increase in theft. My local supermarket and Kmart use them. I hate 'em because They're so impersonal and because they cost jobs. Not very good jobs, but jobs nevertheless for unskilled workers, the most vulnerable in the work force. Today in Oz, trade unions are a shadow of their former selves. A good thing in areas such as Painters And Dockers (Waterfront),and the building industry, because those unions were notoriously corrupt. Not so sure about hospitality and shop workers. The casualisation, and the zero hour contract in some industries here has been catastrophic for many unskilled workers. A contradiction in terms. Employers guarantee no hours, and employees have a right to refuse them. It's the 21st century of men gathering at factory gates, hoping to be chosen for that day's work. Which they could of course refuse. Yet you attribute this immediate snapshot in history as not part of that overarching of ... well, of the entire Western world from the Industrial Revolution onward, but a sudden reaction to current policies. Not really, companies worldwide have been installing robots and machines due to minimal wage hikes for a while now. $15 an hour wage hikes just provided an added incentive to speed up the process. Most efficient staff they ever had. Yup, don't have to worry about quitting, vacation days, calling in sick, or minimal wage hikes. And you can treat the robots like dogs like many of these low wage places do with their clueless owners and managers. However, if they maintain these robots like they did their human employees, soon they will have the same results (breakdowns and errors). Who are they going to blame then????? Where is your data on the ATM or surveillance cameras? Tens of thousands of bank users like myself rarely step into a bank branch anymore and make contact with a live person. It's all automated now. ATM's, online banking, apps on your phone. Let's say if that automation never occurred. Banks would have to hire thousands of more tellers and build hundreds of more branches. They would have to hire thousands of people to answer phone calls about their accounts which can now be checked by using an app. So one could say that due to automation, less people are working now at banks. As for Walmart, I don't believe it is political. The corporation sees a way to automate and save money on menial tasks and make their existing workforce more productive (more money for Walmart). I don't see a reason to layoff workers for this current automation, but I do see them hiring less workers over time. I'm not sure what it's like where you live, but despite the advances in banking apps and ATMs, they continue to build more and more banks here. And like you, I haven't stepped inside a bank in a long time. I rarely need an ATM anymore. But someone must because they keep building more. That was going to happen anyway. They didn't just think of inventing robots last year to begin deploying them now. I am so glad some people can be so gleeful at the sufferings of their fellow Americans. 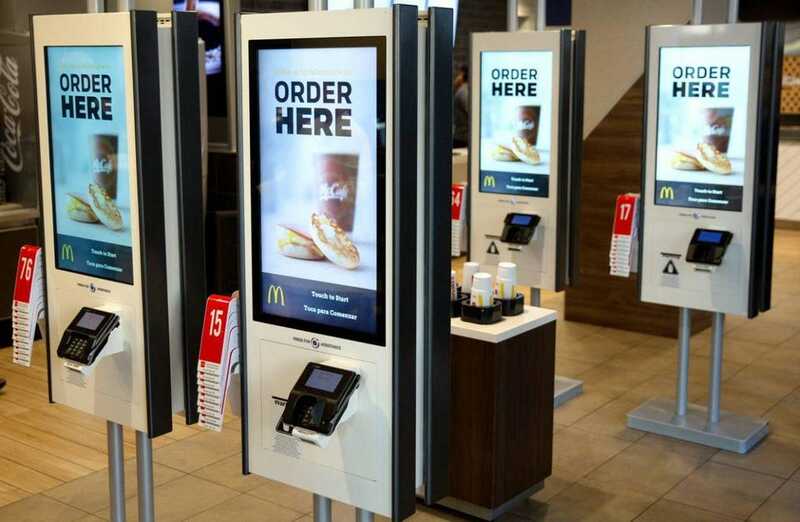 Automation is here regardless of what people think about $15/hr minimum wage. Its just a useful scapegoat and deservedly so. Too many people don't pull their weight at $7.35/hr, what makes you think they will if you pay them almost twice as much? It becomes a cost decision at the end of the day. Its not just your local Wal Mart or Target deploying robots, its in almost every industry now. My industry is shifting as AI is replacing a lot of operations staff. Robots don't call in or make demands that humans do. They don't care about commute, child care costs, and other work-life balance issues. There is a cost to all these issues, and automation will mitigate a lot of this. I predict even the personal shoppers Wal-Mart and other retailers will be replaced soon when robots can pick out the shoppers order faster and for less. The downside is a lot of people who are unwilling to work hard will be permanently displaced as there will be room for only the best and brightest. Not willing to learn new skills or adapt is a sure recipe for irrelevance.